Passage is the perfect romantic getaway for water lovers. It’s a short walk downhill to Corossol Bay, and you can jump into the crystal clear pool straight from your bedroom. The ocean views just don’t quit, and the villa is so open that you’ll be able to see the harbor from every room! The villa is ultra modern and bright, with no frills or barriers to obstruct the view. Instead of a traditional covered porch, this villa has a sail stretched over the deck for shade. Combine that with the up close and personal harbor view, and you’ll think the house is going to sail into the sea! Spectacular ocean views with unforgettable sunsets! Passage is a unique, one-bedroom villa with ultra modern finishes and sleek design, perfect for a couple. 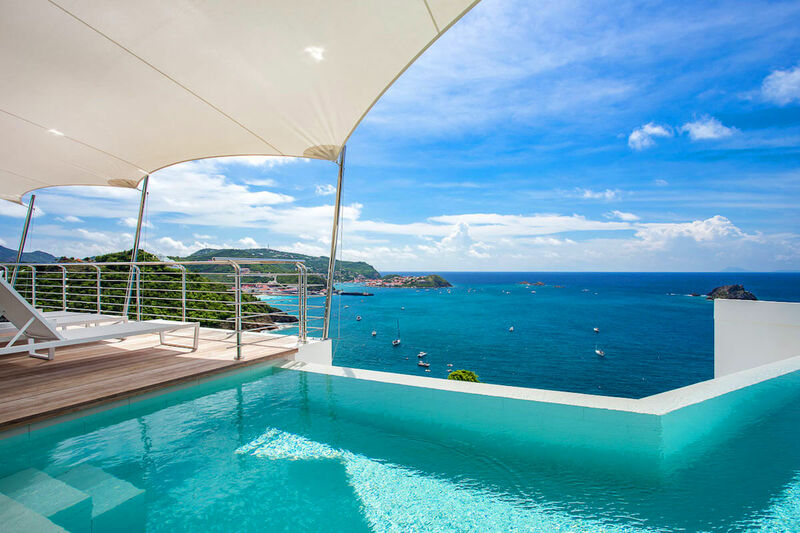 It sits above the Gustavia Harbor with nonstop views of the sea. The villa stands out from the other properties on the hillside, thanks to the massive sail that’s stretched over the deck. Stainless steel rungs along the edge of the terrace combine to create a nautical vibe that echoes the ships in the harbor below. The L-shaped pool flows over the barrier, seeming to flow into the sea. On the left, loungers sit under the sail so guests can enjoy a glass of wine or a beach read while taking in the view. A dining table sits nearby, perfectly set between the island view and ocean view. The indoor dining room sits just inside the villa, with smooth wooden chairs around a large dining table for 8. On one side is the living room, which has a sectional and flatscreen Apple TV. On the other side, the breakfast bar stands between the dining room and kitchen. The kitchen has stainless steel, top-of-the-line appliances and pine cabinetry. The master bedroom opens to the pool and has a flatscreen Apple TV, king-sized bed, and office space. The ensuite bathroom has a walk-in shower with pool access and a large dual vanity. Passage sits high above Corossol, a charming fishing village with calm waters along the shore. The boats in the harbor are authentic fishing boats, and the beach is hardly ever crowded. Rekindle romance in privacy by the sea at Passage villa. Lower Level: A second bedroom located on the lower level is available only for Christmas and New Year.